Besides service tool, mptool is the popularness software to reset printers canon pixma series like MP150, MP160, MP170, MP180, MP450 and MP460. Excess of software that is the program measure of small and amenity of usage. 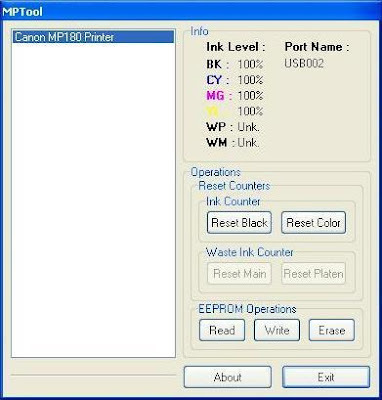 Ability of the software that is to reset level black and color cartridge at canon pixma mp series. And there also facility to write and read EEPROM in the printer. Other excess this software is detect automatically installing printers in the computer. Reset ink counter that is resetting ink level (ink metrer) cartridge at printer. Reset Black – reset level black ink cartridge. Reset Color – reset level colour ink cartridge.